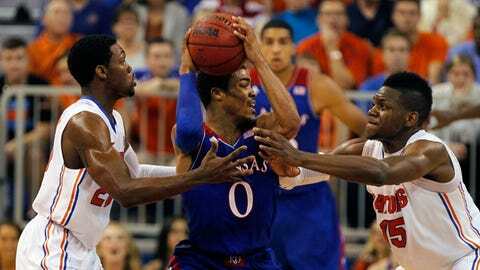 Frank Mason and the Jayhawks had a tough time dealing with Florida's zone defense. Bill Self may think of “zone” as a four-letter word, but that won’t stop other teams from continuing to bash his young Kansas team over the head with it. The book is officially out on the Jayhawks, and we’re two weeks away from Christmas: Zone ’em. Then zone ’em some more. There’s no shame in losing in Gainesville, where the Gators have won 21 straight. Florida’s only setbacks were at unbeaten Wisconsin (10-0) and at unbeaten Connecticut (9-0); if there’s any squad that’s going to stake a claim on the SEC flag besides Kentucky, it’s probably either the Gators (7-2) or Missouri. The shame is how easy Florida made it look. Especially early on. KU raced out to a 10-3 lead, the Gators cranked up their zone, and the Jayhawks spent the rest of the first half taking body blow after body blow, alternating between throwing the ball away or standing around trading dumbfounded looks. Nothing throws cold water over an unsure, hesitant half-court team like a zone defense, and Self’s kiddie corps — KU started four freshmen, the Gators four seniors — are an unsure, hesitant half-court team right now. You can out-athletic a man-to-man look, and the Jayhawks have enough athletes to field two Big 12 lineups. But attacking a zone takes a plan. A strategy. Discipline. When they’re right, the Jayhawks (6-3) are a fun, flowing, well-oiled machine. But throw a zone at them, and it’s like tossing a wrench inside the works. Florida mixed a 1-3-1 look in with a 2-1-2 for much of the first 20 minutes, completely flummoxing Self’s young lineup along the way. KU turned the ball over a jaw-dropping 16 times in the first half; the Jayhawks had averaged just 13.5 giveaways for an entire game in their previous four contests. Over an 8:43 stretch, the hosts turned that 10-3 deficit on its head with a 21-0 run, opening up a 24-10 lead and forcing the Baby Jays to dig out of a hole of their own design. As Dean Wormer used to say, turning the ball over 24 times on the road is no way to go through life, son. Look, the Duke game spoiled us. All of us. Most of the lineup is only a few months removed from their last prom. The only sure thing about first-year college players is that there are no sure things. Some nights, you’ll rise so high, you can take out Duke on a neutral court, no questions asked. And other nights, you’ll act like you’ve never seen a zone defense before in your life. Suddenly, you’re the Washington Generals, and the other team is stealing the ball every other possession and throwing confetti out of buckets at the first row of the crowd. Alas, another brilliant Andrew Wiggins outing (26 points, a new KU high, plus 11 boards) was for naught, although the big Canadian almost dragged the Jayhawks back into this contest all by himself. A Wiggins trey three minutes into the second half cut the deficit to 10, 38-28. Another 3-pointer by the freshman cut the lead to five with 55 seconds left, capping a 12-6 KU run and pulling the visitors to within 60-55. But the cover boy needs help, and there was precious little of that, save for a smattering of Perry Ellis early (four points, three rebounds, three steals, three turnovers) and Joel Embiid late (six points, seven boards, three blocks). Don’t doubt it. The last time a Self team had picked up three losses or more before December 11 was 2005-06. That lineup was painfully young, too, with Brandon Rush, Mario Chalmers and Julian Wright all starting as freshmen. After some choppy waters, they went on to win 10 Big 12 games in a row at one point, snatching a share of the conference title along the way. This story has too many chapters left to write before we take it back to the bookstore, receipt in hand. Although that ’05-06 crew is also the same bunch that lost to Bradley in its first NCAA tournament game, the last Self team — to date — to be one-and-done in the Big Dance. Few scrappy mid-majors will have the combined muscle and experience of this Florida team, but you’d have to think they’ll be hanging on to this particular game tape for future reference. And you better believe they’ll know how to play a zone.